Last week a (large) customer sent me an email indicating he was experiencing issues when compiling the same project on different machines. Turned out the difference was in the source code files format and the root cause was a unit saved as UTF-8 but without a BOM. The reason? One of the developers is using Visual Studio Code... and the solution is a chancing that or using compiler flag. But before I get to the solution, let me show you the problem with a very simple test case. By default, the editor in the Delphi IDE uses ANSI encoding, and everything works fine. You can use the editor context menu, pick the File Format submenu, select UTF8 (I know, missing -), and everything keeps working as expected. 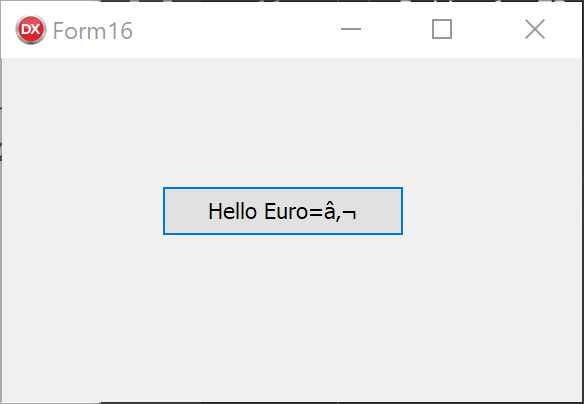 Notice, though the length in bytes of the string changes, as you need multiple bytes to represent the Euro symbol in UTF-8. 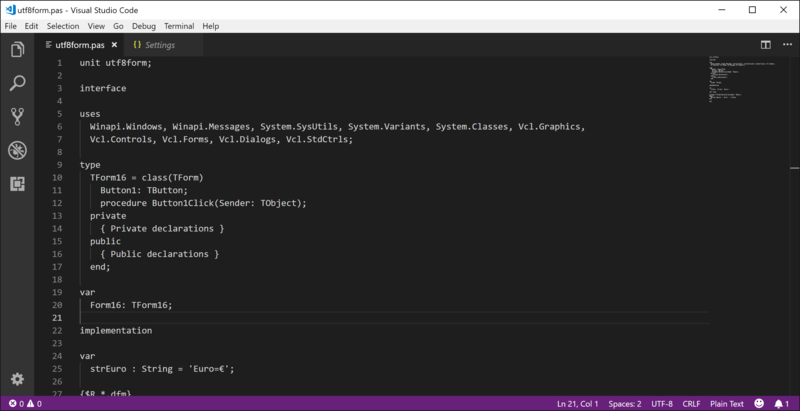 While many modern editors use UTF-8 as their standard file format, a nice option we are considering to default to also in RAD Studio, Visual Studio Code (or VSC) is one of the few that prefers using UTF-8 with no BOM. The BOM (Byte Order Mark) is a sequence of bytes (3 bytes for for UTF-8) that marks the file to make it simple for an editor or a tool processing the file (like a compiler) to figure out the internal format. Given the similarities in many cases, you might have to read an entire file to see if it is UTF-8 or ANSI encoded. Once you realize the issue, the solution is not that complex to achieve. On one side, you can make sure your editors save the UTF-8 files with a BOM. The compiler sees it, and all works fine. I hope this will help you avoid a similar issue. We are researching making the codepage detection automatic, so that the compiler could automatically pick up the right option. But not something we plan to addressing shortly... as the R&D team is busy with the coming release. I'm having a problem that I do not know if it's related to the same subject. When using Vcl.Style in Windows 10, the component that allows you to open the dialog box to select folder or file, displays the popup menu with another encoding. Without using the Vcl.Style works correctly. I use Delphi XE2 Update 4. Please, can you help me with this question?